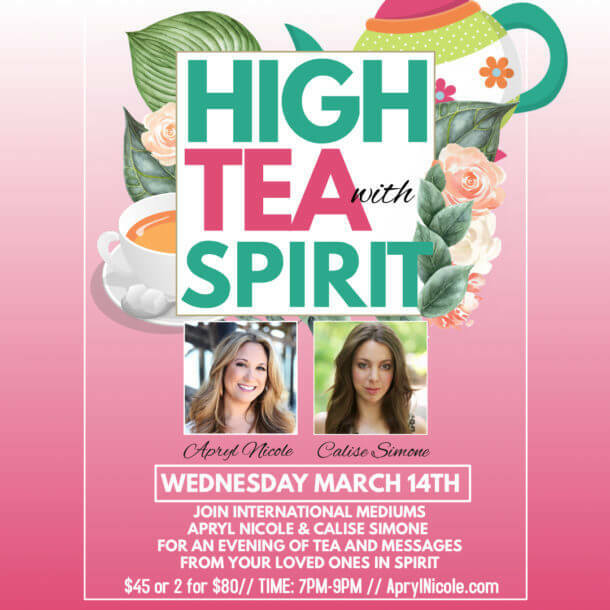 Join International Mediums, Apryl Nicole and Calise Simone for high tea and messages from your loved ones in spirit. This intimate event will be held in Pamela’s Tea Room in Garden Grove, CA. Sit and enjoy a relaxing cup of tea and delicious scones served fresh from Pam and her amazing staff, all while listening to messages from beyond. Apryl Nicole is an internationally, recognized psychic medium based in California, who has been able to communicate with spirit from the age of three. Apryl prides herself as a no-nonsense; tell it how it is medium. She delivers messages with integrity and compassion in order to bring healing, closure, and blessings to those seeking insight and guidance. She has collaborated with many reputable professionals; including Nat Geo Wild with Andre Milan, which highlighted her diverse abilities as an animal communicator. In addition, Apryl has been a guest celebrity reader on many notable podcasts; including Calling Out with Dr. Drew and Susan Pinsky. Amongst her many prestigious awards, Apryl is a proud recipient of the 2017, Social Activist Award with Best American Psychics for her charitable causes. Besides being a top, rated psychic medium in Orange County, Apryl is known for her international touring in Japan. During this time, she received a coveted article in Japan’s pristine spiritual magazine, Star People. Calise Simone is an international Certified Psychic Medium and Spiritual teacher. Calise comes from a lineage of Mediums and Intuitives dating back many generations and has been described by celebrity Clairvoyant Medium Lisa Williams as “A very gifted medium”. Calise reads for celebrities on the LA Music Award-winning podcast ‘Calling Out with Susan Pinsky’ and is a host and producer of the podcast ‘Third Eye Mind’. Calise has been a guest on Radiance Talk Show on the Brooklyn Public Network, Cablevision and on FUSE TV.